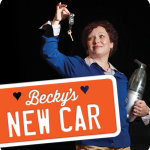 Becky’s life isn’t exactly unhappy — but from her desk at a car dealership, she can’t help but wonder what else is out there. And then she finds out. When a wealthy suitor presumes she is a widow — and she doesn’t correct him — she finds herself leading a double life until it quickly (and hilariously) accelerates out of her control. This clever and witty new comedy shows us an unexpected and inventive way to escape the midlife doldrums.